Alright, so I figured I would start this thread to put my thoughts together on the sticks that I smoke. Just gonna go ahead and make one thread so that I'm not starting a new one everyday and this way I can keep track of my experiences in one place. Outdoor: Sun peaking through the clouds and a warm 35. Yikes! The prelight construction of the cigar seemed to be pretty decent. After lighting the wrapper developed two large cracks in the wrapper which, fortunately, didn't affect the burn too much. The first third of the smoke gave me strong hints of black pepper, especially on the back of my mouth. I couldn't pull anything else from this third, but it was quite enjoyable. In the second third I started to get some hints of chocolate, while still tasting the black pepper (interesting combo) until about halfway through the second third when the pepper disappeared and the chocolate came on strong. Then in the last third came the nice taste of cream with a hint of woody taste that eventually took over by the time I finished the cigar. As for the burn, it was excellent. I didn't have any issues or have to relight, which is good for me since I'm a newb and I usually mess something up. Also to burn through those cracks was pretty impressive. The draw was easy and smooth and produced very thick plumes of smoke throughout the entire time I was smoking. It also maintained a very nice ash. Overall, I enjoyed this cigar. It was a nice medium strength and not overpowering, and I enjoyed the different taste profiles that I experienced. I read some reviews before smoking that said that this particular stick didn't really have a lot of different tastes, so maybe my palate is just totally screwed up, but hey everyone's different. I don't think I would shuck out $30 for this guy, but I wouldn't pass the opportunity to smoke another one if it arises. Hope you enjoyed reading my "newb review". This was my first time ever trying to remember the tastes to write them all down, so it really brought a whole new enjoyment to my cigar experience. Hope you all had a great day, God Bless! Everyone starts somewhere. Nice review! Better than my reviews. "It tasted like hot smoke"
Temperature came up a little today, the sun was out, and the rain let up so I was finally able to take some time to try out a new stick! The cigar that jumped out of the humi begging to be smoked today was this Cuba Aliados by Rolando Reyes. The cigar had a beautiful wrapper, with no obvious construction issues. After I made the cut and gave it a prelight draw I felt like I would really enjoy this one. So it was time to light it up! 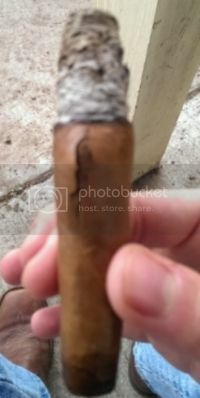 The first thing worth mentioning is that this particular cigar lit perfectly right away and had an awesome burn. Good volumes of smoke that had a very sweet, earthy smell with hints of cedar. It was quite pleasant. The first third had an earthy taste with some spice hints peeking in. 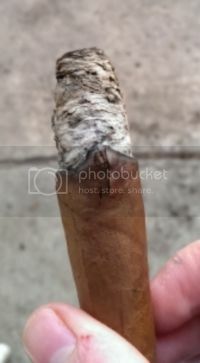 It maintained a very nice ash during this time. It started off feeling pretty full bodied but this began to tame by the end of the first third. Moving into the second third, the spice taste was phased out, but the earthy tones remained. This would hold true throughout the rest of the cigar. The second and last third definitely set this stick right into that Medium bodied range. So now I was really enjoying the medium strength, the earthy tones, and the excellent burn quality and draw of this stick. Very enjoyable and I'm feeling like this could be a stick worth stocking a few more in the humi. In summary, this was a great smoke. I enjoyed the aroma of the smoke and liked the fact that the taste didn't really linger on my palate for long. It was refreshing each time I took another puff. 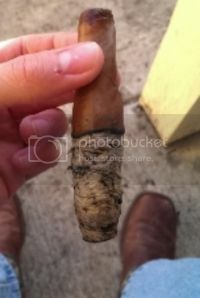 The cigar lasted for about an hour by the time I got to the last ~2" of the stick. At the end, the ash unexpectedly fell off and it looked like there was a little bit of tunneling. I was pretty much finished with it by then though, and I am not totally sure what caused that. In the end, I definitely want to get a few more of these, I can definitely see myself enjoying them again in the future and they won't break the bank. Hope y'all enjoyed reading this review. God Bless! Excellent review on the Centurian! !! this is a stick I want to try as well, and now that Ive read your review I wanna try it even more thanks Dan!